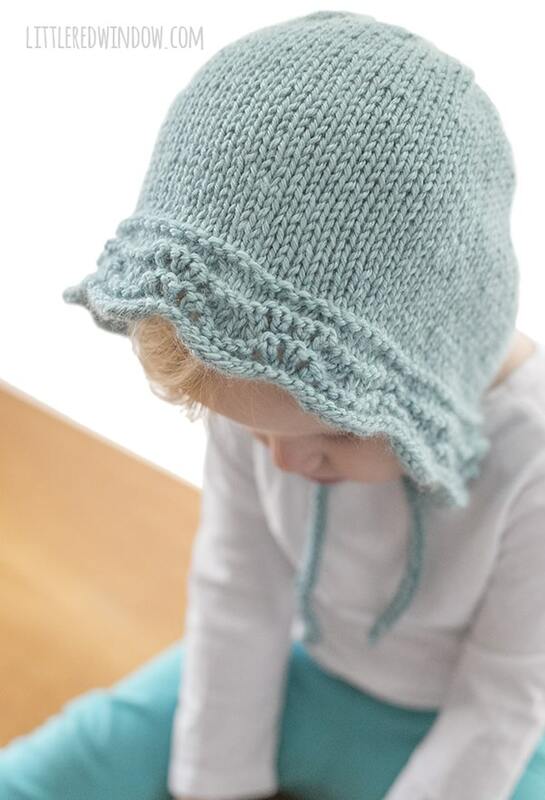 This adorable bluebell baby bonnet knitting pattern uses a feather and fan stitch to create this beautiful wavy edge. It will look so sweet on your newborn, baby or toddler! 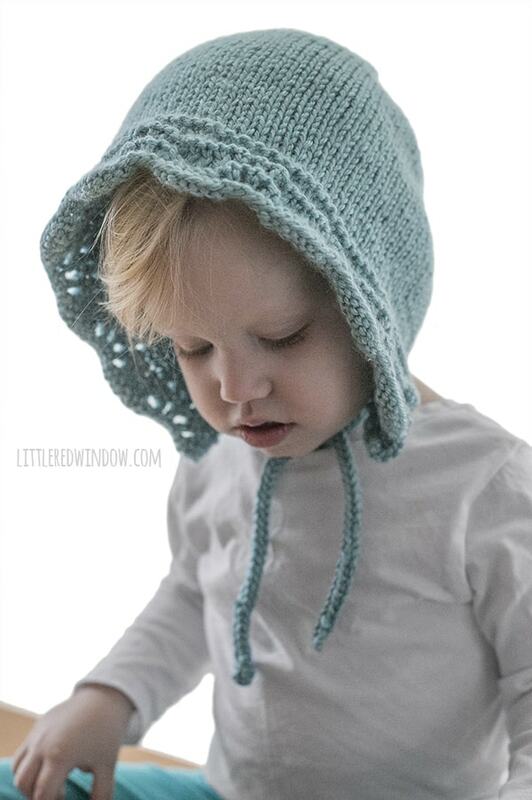 This adorable bluebell baby bonnet knitting pattern just makes my heart melt. Actually, just after I knit up this baby bonnet pattern, my mom gifted me with some vintage Christmas tree ornaments that had been handpainted in the 50’s by a friend of my Grandma. They’re all little people and animals and one of them is a little girl watering flowers and wearing a flowered dress and a blue bonnet JUST like this. 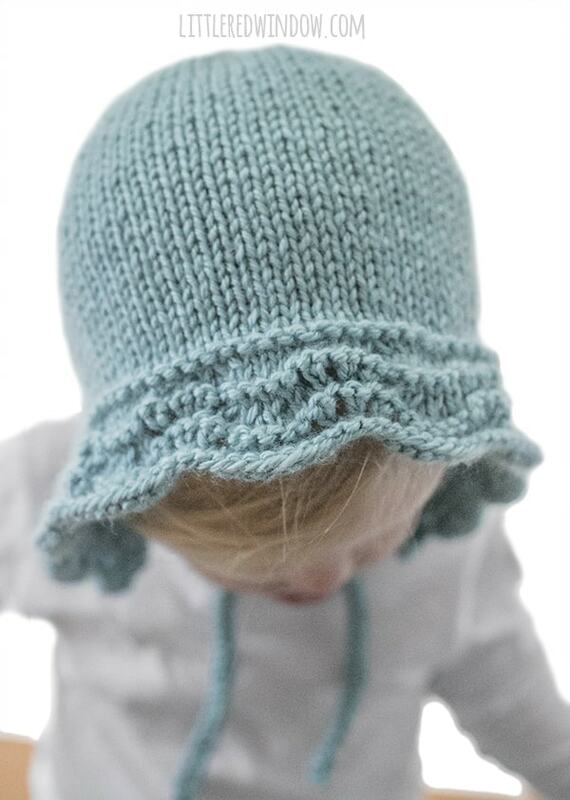 So clearly I was subconsciously thinking of that when I designed the bluebell baby bonnet knitting pattern! 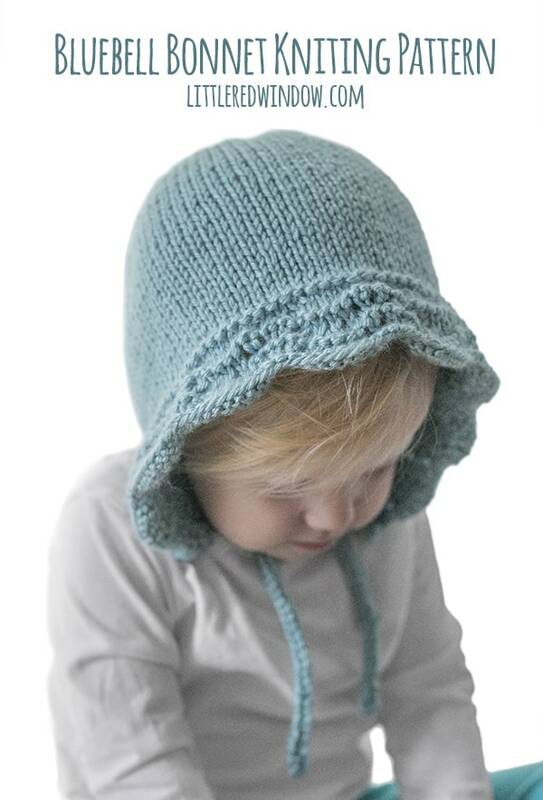 Anyway, the beautiful wavy edge of the bluebell baby bonnet knitting pattern is created with a variation of a feather and fan knitting stitch. This is a lace stitch which means is uses a pattern of yarn over increases and decreases to make a pattern. It took some serious math for me to get the stitch counts right on this one, but I did it! The good news is, it’s a really easy stitch to do, just takes a little bit of counting! I love this stitch, because the lace feather and fan pattern keeps the edge from curling up and provides such an adorable frame to chubby sweet cheeks! I do recommend that you block this bonnet if you can, to make that gorgeous lace edge look its best! 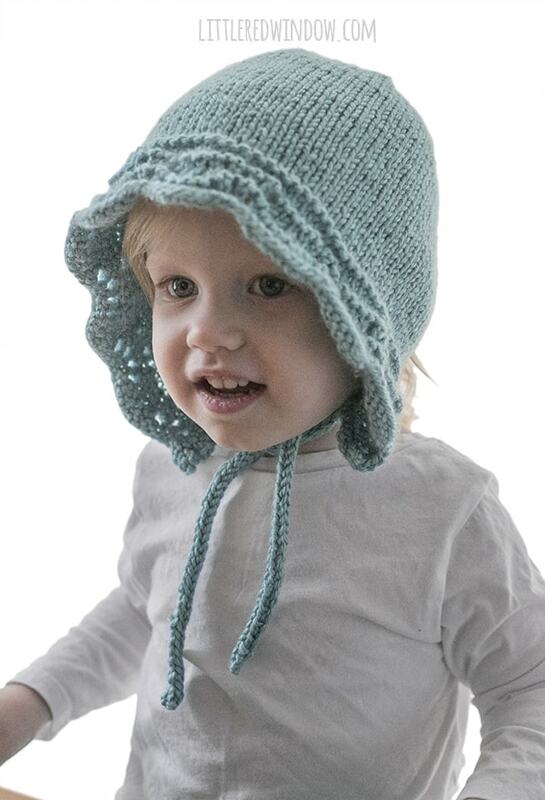 This sweet baby bonnet is going to be on repeat all spring at our house! When I finished the bluebell baby bonnet knitting pattern, I told Aa I might never make anything but bonnets ever again, they’re just so stinkin’ cute! (Obviously I won’t really do that, ha!) And remember, if you knit up this bonnet, please use common sense, don’t tie the chin straps too tight and never leave baby unattended while wearing it. Safety first! I hate double pointed needles. I wish the pattern was for flat knitting.